My fascination with Asian temples in Los Angeles area started a few years ago. Around that time, my husband started introducing me to Asian culture. The first thing he showed was Malibu Hindu temple. Needless to say, I was instantly smitten by the magnificence of this structure, my first Asian temple in Los Angeles. I remember thinking that it looked exactly like Hindu temples in Bollywood movies. It was so surreal. From that time, more and more Asian temples in Los Angeles region have opened their doors to my curiosity. With respect to all religions and not trying to offend anybody, I’d like to make some clarifications before going further. Under the term “Asian temples”, I mean, first of all, the stunning architectural styles and cultural traditions. The incredible details of almost every structure make you wonder how in the whole world it was possible to create something magnificent and majestic. For me, these gorgeous temples are true masterpieces that deserve recognition and admiration. So, let’s visit some of the most beautiful Asian temples in and near Los Angeles. Here are the 5 Asian Temples in Los Angeles Area that Deserve Your Attention. The BAPS Shri Swaminarayn Mandir is one of the largest Hindu temples in Southern California. Moreover, it’s the first earthquake-proof temple in the world. Located in Chino Hills, this is by far one of the most stunning Asian temples in Los Angeles area. The structure is so beautiful and amazing that it’s hard to describe it in words. Everything about this Asian temple is unique. 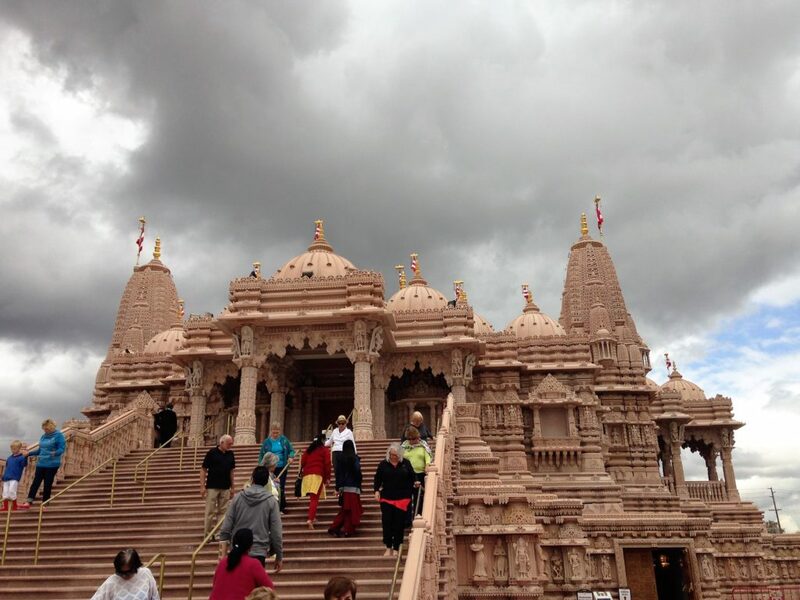 In the construction of the BAPS Shri Swaminarayan Mandir were used only two materials: Carrara marble, the white marble quarried in Carrara, Italy, and Indian Pink sandstone. Before sending the marble and sandstone to Los Angeles, artisans in India meticulously hand carved each and single piece. You can see their love and dedication everywhere in the temple. Their skillful carvings in cover every inch of the temple from the external walls to internal pillars and ceiling. The BAPS Shri Swaminarayan Mandir is open for people of any religion. However, while visiting this Asian temple, show respect and adhere to dress code accepted here. You can find all necessary details on http://www.bapschinohills.org/visitorinfo.html. 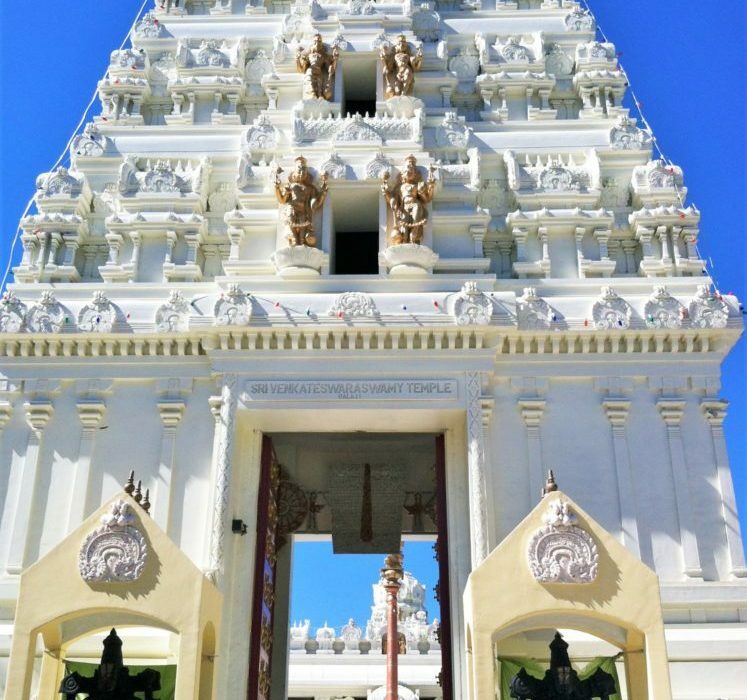 Despite its name, Malibu Hindu Temple is located in the city of Calabasas near Malibu. This Asian place of worship was built in 1981 in accordance with traditional South Indian style. The walls of the temple are completely white and covered with beautiful carvings of the Hindu gods. Untypical for many Asian temples, the Malibu Temple has shrines not just for one but for many Hindu gods. On top of that, the most visited Asian temple in Los Angeles region has two complexes. Each of them conducts many ceremonial gatherings and offers enough space for meditation. 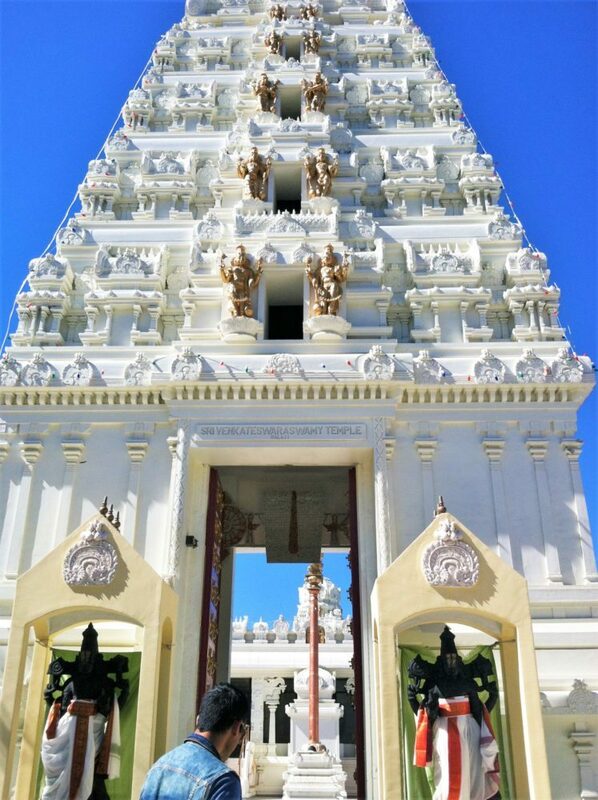 Be sure to visit this Los Angeles temple on weekends when you can try some delicious Indian vegetarian food. 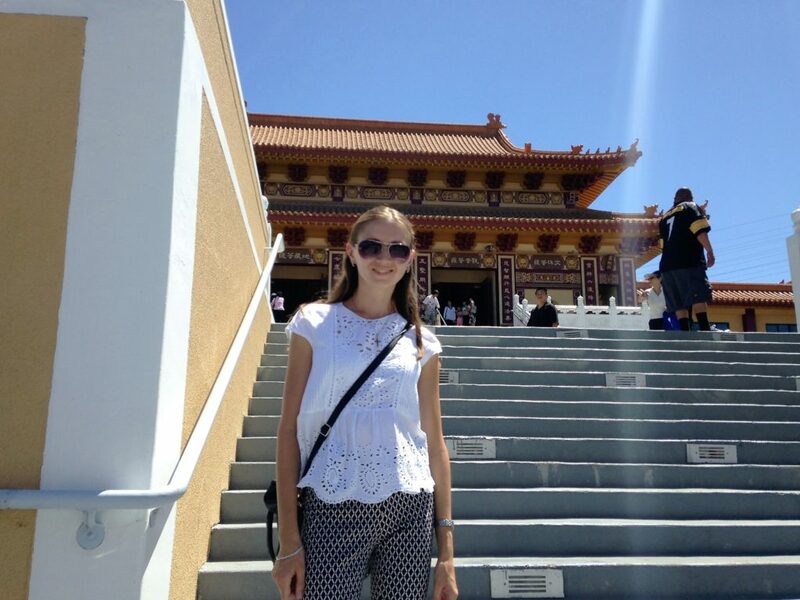 Hsi Lai Temple is one of the most beautiful Asian temples in Los Angeles area. Hsi Lai Temple (“Hsi Lai” means “Coming West”) is the largest Chinese temple and monastery in the United States. The temple is affiliated with a Fo Guang Shan, a Buddhist organization from Taiwan and focuses on Buddhist outreach and unity. The design of Hsi Lai Temple complies with traditional Chinese architecture and consists of several temple building, gardens, and statuary. So, take a walk through this Asian temple and enjoy its beautiful complexes and gardens. If you want to know more about the His Lai Temple and Chinese culture, request some guided tours for groups of 15 people or more. You can also explore this Asian temple in Los Angeles area on your own or take a class on Buddhism or Chinese culture and language provided by residing here monks and nuns. Don’t forget to stop by at temple’s cafeteria and have Chinese and Taiwanese home-style cooking vegetarian lunch. 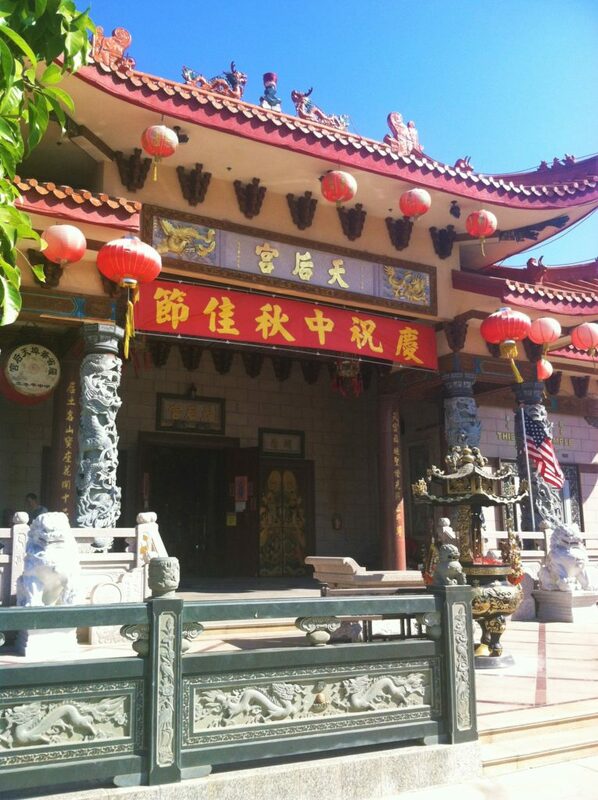 Located in Chinatown Los Angeles, Thien Hau Temple is one of the most popular temples for worship among Asian residents of the Los Angeles area. The temple is dedicated to Mazu, the goddess of the sea. Originally, the building belonged to the Italian Christian Church. In 1980s, God-fearing community in Chinatown purchased the structure and have been using it as their favorite Asian temple in Los Angeles region. 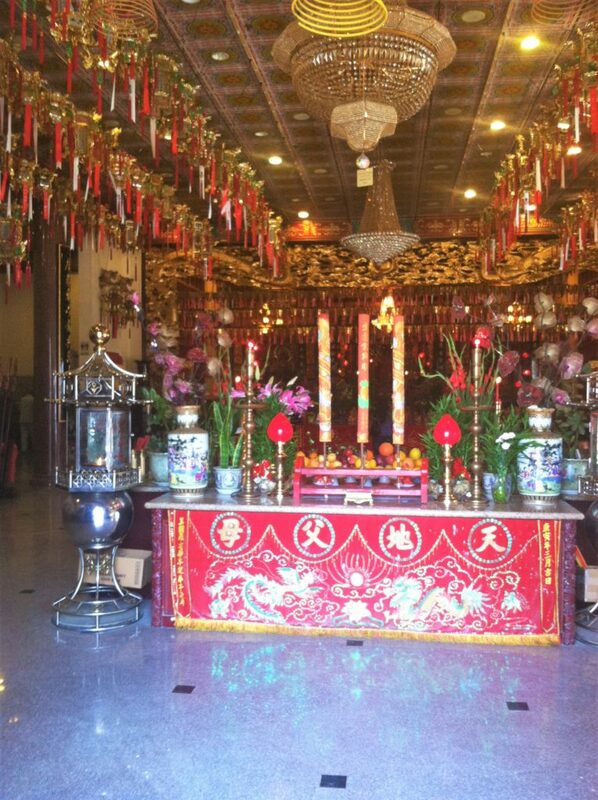 Thien Hau Temple is especially festive before and after Chinese New Year. On Chinese New Year’s Eve, many people come to the temple to receive blessings and burn incense. During this time you will see lion dancers’ performances and popping firecrackers, traditional rituals to scare away evil spirits. Wat Thai of Los Angeles one of the best Asian temples in Los Angeles to get Thai food. 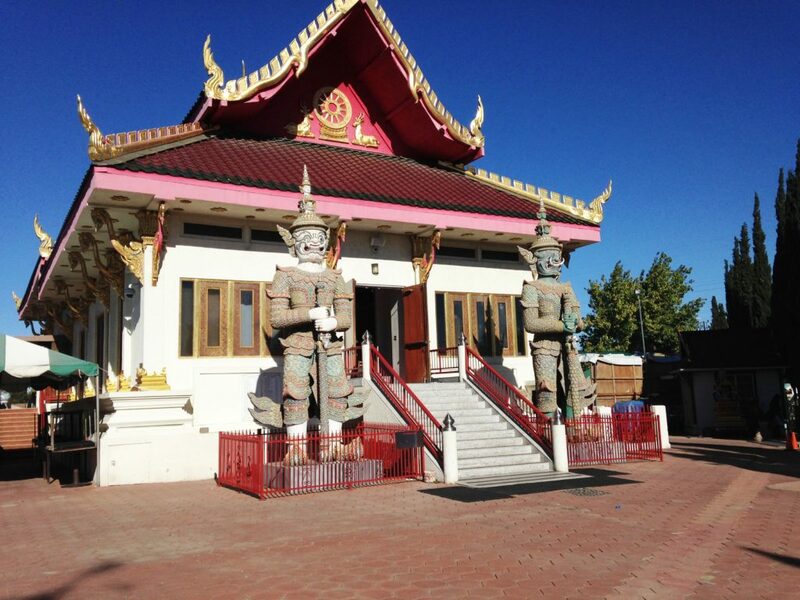 Not as big and impressive as other Asian temples in Los Angeles, Wat Tai Buddhist Temple deserves to be mentioned here as a place where you can get the best Thai food in the city. Sounds surprising? The Thai Temple of Los Angeles started serving the food from an outdoor food court in its parking lot almost four decades ago and has been doing it ever since. Every weekend you can get taste of the real Thai street food without traveling all the way to Bangkok. Green curry, boat noodles, chicken curry dumplings, mango sticky rice, just to name a few of them. Everybody, vegetarians as well as meat-eaters, will satisfy their taste buds here. Make a plan and head out to Wat Tai Temple next weekend and try it yourself. WHAT? I barely believe that this is Los Angeles! Thats beautiful, I’d never imagine. Im glad I saw this post, Im planning on go there this year!